A Cheery Game to Guarantee Smiles! 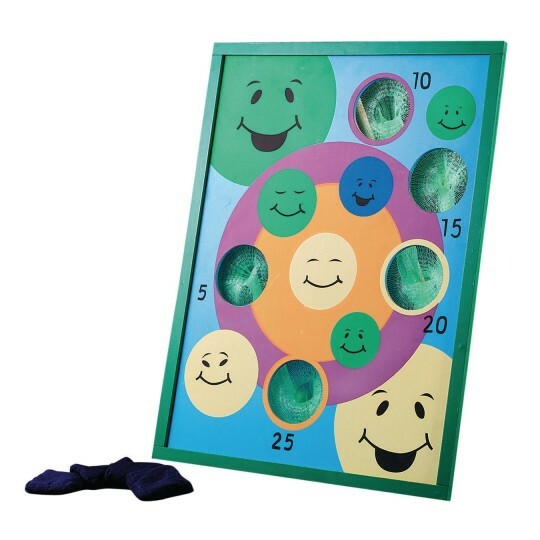 Classic wooden tossing game with smiling faces design. Features 5 holes with nets and 5 beanbags. Set it up anywhere for instant fun! We use this in our adult day care program. I WAS VER VERY DISAPOINTED. Sadly this product of the dozens I bought was the only one that didn't work well. It is much smaller than you would imagine but worse the holes are so small and it's not angled well that it's even hard for grown athletes to get the bags through the holes. I don't recommend this product. SS took it back without a problem. Merchant response: Thank you for taking the time to write a review. Your comments have been forwarded to the product manager. Smaller than it looks in pictures.